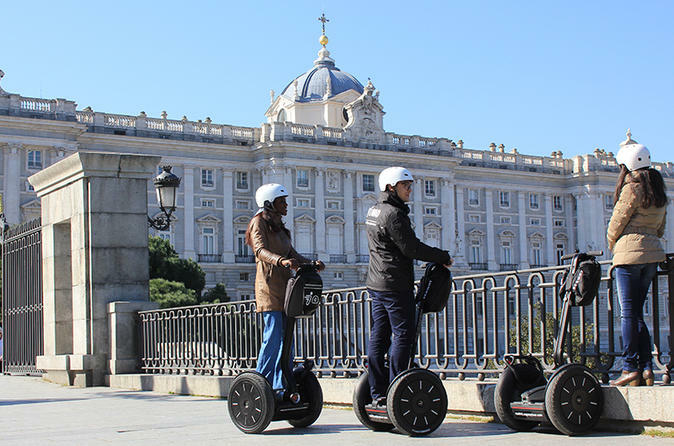 This 3-hour Segway Tour will take you to Madrid’s central district, which is the capital’s historical and cultural hotspot (see two-hour tour). Visit the Paseo de Prado with its world-famous museums and the city’s vast urban park El Retiro. In addition to learning about the capital’s major sights, your guide will introduce to you the history and cultural background of all the places you visit, as well as inform you about Madrid in general. Meet your guide in Plaza España, in front of the famous statue dedicated to Cervantes, widely regarded as the greatest writer in the Spanish Golden Age. After an initial training and safety briefing to get to grips with the Segway, glide along Plaza de Oriente to discover the baroque statue of Felipe IV (Philip IV of Spain) whose construction required two geniuses of the era; Diego Velázquez and Galileo Galilei, and be surprised about the interesting stories of the statues all over the square. Nearby, you will be able to admire the facade of the Royal Palace and take photos at the “Plaza de Armas” facing the Almudena Cathedral, the only Spanish cathedral to have been consecrated by a Pope. Learn about the mystery that has been kept hidden for ages in Plaza Ramales, and glide through the historical neighborhood of Los Austrias to reach the heart of the medieval city - Plaza de la Villa. Narrow streets and alleys lead to the Mercado de San Miguel, one of Madrid’s oldest and most beautiful markets, from where you will continue on to the Plaza de Puerta Cerrada to know about many legends and curiosities of the Villa. Stop in Plaza Mayor and enjoy the historical Bakery House building, listening as your guide shares details on its history and its murals' significance. Make your way along the Literary Quarter en route to the Paseo del Prado, where you will pass next to the exceptional Atocha station to see the statue of Claudio Moyano and Pío Baroja in the way of the Retiro Park. Cruise on to the pathways to see the 'Fallen Angel' statue and pass next to the french-inspired garden of La Rosaleda, to take a little break next to the Crystal Palace. Admire your lovely natural surroundings and pause to take photos by the imposing monument to Alfonso XII, before visiting one of the most representatives places in Madrid, Puerta de Alcalá. Follow your guide down Alcalá street and see several historical sites like the popular Cibeles fountain or the Real Academia de Bellas Artes de San Fernando. The tour’s final part leads you to the Puerta del Sol and San Gines - one of Madrid's oldest churches - and the Royal Theatre, before ending at Plaza de España.